Protestants usually don’t pay attention to the Stations of the cross. And the reasons may have to do that it has been traditionally associated with the Catholic Church or that it has been depicted by icons that are permanently displayed in churches or simply because we are not prone to any kind of ritualistic, high church display of devotion toward God. Too bad, I think. 2. Jesus is betrayed by Judas and arrested. 3. Jesus is condemned by the Sanhedrin. 4. Jesus is denied by Peter. 5. Jesus is judged by Pilate. 6. Jesus is scourged and crowned with thorns. 7. Jesus takes up his cross. 8. Jesus is helped by Simon to carry his cross. 9. Jesus meets the women of Jerusalem. 11. Jesus promises his kingdom to the repentant thief. 12. Jesus entrusts Mary and John to each other. 13. Jesus dies on the cross. Today I want to speak briefly about the first Station. A walk in the Garden… How many times had Jesus taken that walk to spend some quiet time with His father in the Garden? Luke and John both tell us that Jesus was in the habit of going there when he was near Jerusalem (Luke 22:39; John 18:2). Jesus and the disciples walked from the place where they held their last supper to the Garden. 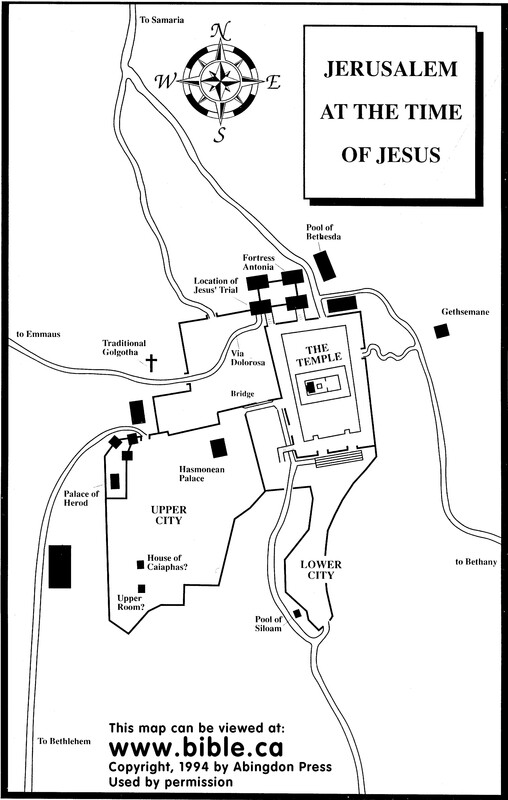 We don’t know the exact location of the upper room, but we know that the distance from the wall of Jerusalem to the traditional site of the Garden was about half a mile. But the terrain is hilly and Jesus had a lot on his mind. It would be his last hours with his closest friends before His crucifixion. The last communication with His friends before His crucifixion, except for a brief glance at Peter after his denial and a few words from the cross. This would be a different kind of walk to the Garden. We don’t know exactly when Jesus began to give his disciples the last set of instructions before going to the cross (see John 13-16), but it is possible that He was nearly finished right before they started the walk to the Garden. This could have been a quiet last journey together or Jesus could have finished the talk on the way. As they proceeded north, they may have passed Caiaphas’ house. He was the one who had prophesied that Jesus was going to die for the sins of the nation (John 11:49, 50, 52). He had also vowed to make sure that he lent his hands to get that done, as we learn from John: “… from that day on [they, i.e., Caiaphas and the Sanhedrin] planned together to kill him.” (John 11:45-53). Given the possibility that the guards were looking for Him, Jesus may have taken a different route out of the city, avoiding the southern wall, which had a vantage point overlooking the valley of Hinnom, the garbage dump of the city. The fires which burned 24-7 there could be seen from a distance, reminding everyone of “Gehenna” in the Greek, the name of the valley in their language, which was a metaphor for “death.” Jesus knew what awaited Him and He knew what was at stake. Failure was not an option. After going through a rich neighborhood, they continued northwards, passing by the pool of Siloam, where a blind man had received his sight (John 9:1-7). I just wondered what could possibly be on the disciples’ minds as they passed by there. Would they later make the connection that Jesus came to open the eyes of the blind and release the captives from prison? The walk would eventually take them pass the highest point of the temple to the outskirts of the city, descending into the Kidron valley, where our Lord would agonize in his final hours before His betrayal and death. Today we walk to relieve stress. We walk to feel better about ourselves. We walk to clear our heads and lessen our burdens. My Jesus walked to face His accusers. He walked to His final hour of testing, away from comfort and resolutely toward the final conflagration with the forces of evil. Because He walked, my walk is lighter. Because He did not look back, I can look ahead to a brighter future. Because He finished the walk, I can lean on Him when the journey gets harder or I get lost on the way. Thank you, Jesus, for that walk to the Garden. Thank you my dear pastor for sharing from your heart and knowledge of our Beloved Saviors final and painful steps as He proceeded ahead without any reserve to secure our place in eternity with Him. I agree that many churches including our own have left out of our sancturies thru Church building projects over time for a variety of reasons, visual objects that relate to God’s interaction with mankind. Many sacturaries today are multi purpose rooms and few actually resemble a religious worship area. When I walk inside an older church sanctuary it has an appearance of Holy and Reverenced atmosphere. I am sure the discussion to have or not to have syballistic Biblical references in the church sanctuary may have little impact on a devoted follower of Jesus Christ. So it is good to refresh the mind with the Stations of the Cross to remind ourselves of the great love Jesus has for mankind. Amen, Dave. Thanks for sharing. We call all learn from different traditions. All Truth is God’s truth.